Ciao Patrick! Although Italy cannot claim St. Patrick as their favorite son, Patrick’s parents were citizens of Rome so it’s easy for Italians to translate the green in their flag to the “wearin of the green” on St. Patrick’s Day. There are many Irish pubs in Italy and you can be sure they will be serving Guinness on draught and Irish whiskey on March 17th along with pasta and pizza and Irish Espresso. Take a St. Patrick’s Day tour of Italy beginning with Italy’s Celtic roots and then travel to Rome to visit its Irish churches. St. Isidore, San Clemente near the Roman Colosseum (known for its frescoes and twelfth-century mosaics), San Silvestro and St. Patrick with its Celtic design cathedral windows. A burial plaque commemorating Brian Boru’s son, King Donnchadh of Munster, can be found among the Roman columns of the 4th century basilica of St. Stefano Rotondo . He died during a pilgrimage to Rome and was buried here in 1064. And if you listen closely you might hear the sound of bagpipes. Italy has a small but rich bagpipe tradition. 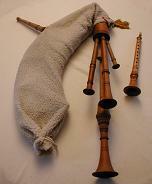 The zampogna (Italian bagpipe) is part of a vibrant folk tradition in Abruzzo, Molise and Southern Italy where the zampognari (bagpipe players) appear in open air markets and in the streets during the Christmas season as shepherds that came down from the hills to celebrate and entertain the people. March 8 is International Women’s Day, a global initiative that celebrates the social, economic and political achievements of women past, present and future. On this day the world joins hands together to support, raise, inspire and motivate women across all fields of work. In Italy the day is celebrated as Festa della Donna and fragrant bouquets of bright yellow mimosa are found everywhere as a symbol of support and appreciation for women and all they do. Over the centuries there have been many notable Italian women who have served as inspiring examples to all. Women dedicated to their families, their parents, husbands and children with talents that have extended within and beyond their communities and enriched the common culture of our world. One such woman was Giuditta Brozzetti whose name remains attached to the weaving cooperative she founded in the Northern Italian city of Perugia. Her story begins in the middle of the First World War. As director of elementary schools for the city of Perugia she traveled the region visiting the village schools and passing farmhouses where women working in the fields tended to the animals and harvested crops to provide for themselves and their families as their husbands, brothers and fathers were at war. Brozzetti also noted that women in the villages were skilled weavers working on antique wooden looms hand-weaving textiles in the traditional way producing fabrics and ancient patterns of great beauty. Impressed by what she saw and recognizing the value in the quality and craftsmanship of their work, Brozzetti began bringing the textiles to markets in Perugia, helping to create another form of income for the rural women. In 1921 Brozetti founded a workshop and school in Perugia to showcase the handwork of the village women and teach the traditional hand-weaving ways and heritage patterns that dated back to Umbria’s Medieval and Renaissance textile traditions. Today in Perugia’s San Francesco delle Donne, a deconsecrated 13th-century church, the entrepreneurial spirit of Giuditta Brozzetti lives on as a community based women’s cooperative continuing the tradition of hand-weaving following the same intricate patterns as the originals, many created on antique pedal looms. Kept alive by generations of talented, committed, entrepreneurial women creating brilliant textiles that connect modern Perugia to its rich and invaluable heritage and past. According to the Tacuinum Sanitatis, a medieval handbook on health and well-being the way to a man’s heart was apparently through a tomato. Advice given in the Tacuinum was based on an eleventh-century Arab medical treatise, the Taqwīm as‑siḥḥahتقويم الصحة (“Maintenance of Health”), and describes detailed accounts of the beneficial and harmful properties of foods and plants including a veiled reference to the tomato. During the 14th century manuscripts of the handbook were commissioned by northern Italian nobility during the 14th century as a practical guide for improving health. Lavishly decorated manuscripts illustrate nobles engaged in work, play and romance and the cultivation of all manner of fruits, vegetables and herbs. Directions for the use, preparation and experience of the plant is explained through an elaborate iconography of meaning. Feudal lords, ladies and laborers engage in the work of the estate in a world where horticulture, health and personal relationships are intertwined. Medieval gardens with wattled fences are carefully tended to bring out the best attributes of the fruits, vegetables and those who ate and tended them. In one scene a couple embraces in a garden of eggplants implicating their aphrodisiac properties. In another carrots are harvested and described in the Latin text to stimulate sexual relations but slow down digestion, and that the purple type, ripe in winter, are the best. Other scenes depict harvesting dill, picking chestnuts, the usefulness and dangers of cabbage, tending marjoram and making soup. A mixture of medicine and myth where tomatoes become botanically related to the mandrake or “love plant”, believed to inflame a man’s amorous intentions and said to be able to “lead a man like a dog”. As dogs were often used to pull out the root of the believed-to-be-bewitched mandrake with a man standing in wait to see if the dog survived the mandrake’s deathly curse, it may have seemed like the mandrake and related tomato had powers to lead a man. When the Spanish brought the first tomato seeds to Southern Europe in the early 16th century, a large percentage of Europeans feared the perceived properties of the fruit. But around 1880, with the invention of the pizza in Naples, the tomato’s popularity grew. The Italian pomodoro (pom d’or) apple of gold was becoming a sought after ingredient, juicy, full of flavor, both tangy and sweet. Italian cooks embraced it’s use in sauces that would eventually catch the eye (and taste buds) of a Queen named Margherita. Every Italian Nonna has her favorite recipe for a tomato ragu’ or marinara that keep her sons and grandsons close to home. So it may not be so far fetched to think that the tomato has powers both in and out of the kitchen. Food is a celebration and a pleasure. Taken together, they make the everyday act of eating more than a blip on the radar of life. Whatever we eat or drink should bring health to the body and joy to our day. I believe this because after eating, shopping, cooking and traveling in Italy with our Italian family and friends I’ve learned that every plate of food and every bottle of wine brings life to the Italian table. I’ve come to realize the pivotal place food has in Italian culture. Italians take time and effort to prepare a well-laid table where there is beauty and grace in the smallest detail. Meals are an essential part of Italian life. Not that they obsess about food or over indulge. Italians truly value food and its preparation. Generational family recipes bring meaning to what is eaten. Shoppers rely on traditional and local ingredients. Excellent ingredients stand out in a dish providing both taste and nutrition and bright lively flavors. Back in the States, the mediocrity of eating is a well traveled road we take everyday. Lower food priorities and less inspiring ingredients and options often cause us to settle for less. We eat and say the food was ok, it was good, but was it great. We generally don’t expect it to be so. Our busy lives, filled with multi-tasking, can feel really uncomfortable to do anything else but simply eat and accept what is put before us. It’s been said that we are what we eat. It’s been shown that mindfully eating with attention to the ingredients, methods and preparation of the food has positive satisfying benefits. Spending time sourcing your ingredients impacts food choices far beyond a single table. It sends a message to suppliers that you value what they do and encourages them, many of whom our small producers and generational families, to continue bringing their products to the market. Eating all that is excellent is about choices. Commit your time, effort and food budget to better ingredients and better preparation. Preparing a well-laid table to share and enjoy with your family and friends in a relaxed and tranquil manner is a lost pleasure that must be found again and one thing we can do to make a better life. The scale and scope of the Renaissance was huge so it’s no surprise that keeping a calendar of the months of the year would be any different. The fresco artists of Italy’s quattrocento were masters at large scale installations and often used their art to interpret the months of the year and bring attention to the passage of time and its implications. Fresco cycles with symbols and designs that represent the astrological horoscope and seasons can be found in the salons and halls of Italy’s most renown palazzi and villas. Many 15th century fresco artists interpreted the months of the year with such stunning results that their work is among the great art of the western world. One of my favorites is in the Palazzo Schifanoia in Ferrara, a UNESCO World Heritage Site. Painted by Francesco del Cossa and Cosimo Tura, the frescoes line the walls of the Salone dei Mese (Room of Months) in the main hall. Designed for the Estense Court of Ferrara as a retreat for pleasure and diversions (schiafonia is thought to originate from the word schivar la noia meaning “escape from boredom”) Palazzo Schifanoia is a hidden jewel on a side street of Ferrara. With a rather plain and unassuming façade, the elegant marble entry with the Estense coat of arms may be the only sign that you are about to enter into a pleasure palace filled with rare beauty and earthly delights. The allegorical frescoes of the Ciclo de Mesi (cycle of months) are considered to be one of the greatest examples of humanistic astrological Italian art making it the most glorious wall calendar I ever saw. Fritters, sun-dried, zucchini flowers fried and stuffed (Fiori di Zucca), sautéed with olive oil and Italian herbs. Italians love zucchino, the diminutive of zucca “squash”. When grown properly it is tender and palatable. The thin skin need not be removed like its invernale (winter squash) cousin and can be eaten raw or cooked. Italians love it. Every garden grows zucchini and depending on where you are in Italy they are at their height and plentiful all three months of the summer. Italians use zucchini in many ways: on top of pizza, inside lasagna, baked into focaccia, in soups and as a contorno, side dish. Our Nonna made them simply with onions and tomatoes sautéed in olive oil with basil and oregano. Italians literally relish in the natural verdant flavors of zucchini and typically don’t feel compelled to turn this vegetable into something it is not such as a dessert mixing in cocoa and chocolate in a sneaky attempt to get their kids to eat more vegetables. They don’t feel the need to conceal its texture, treat it as a second class ingredient or masquerade its flavor. They like it and accept it as it is. There is not one recipe in The Silver Spoon, Italy’s most iconic cookbook, that uses zucchini as a dolce. Perhaps the closest interpretation may be as an ingredient in Verdure Agrodolce, a sour and sweet mix of vegetables in a vinegar and sugar base flavored with herbs and garlic. However when zucchini is baked into something sweet, like this recipe from a family feast for Italian Cinnamon Zucchini Bread from Boston’s famous North End, pretty much anyone can get behind this Italian summer squash. Together with Collodi’s Pinocchio and Manzoni’s The Betrothed, Pellegrino Artusi’s La Scienza in Cucina e l’Arte di Mangiar Bene is one of Italy’s most read books. With over 700 printings it is one the most referenced books on the science and art of cooking and eating well. Known as the “great-grandfather of all Italian cookbooks” it has been in print continuously since 1894 and translated in hundreds of languages. The common matter that these three books share is one of instruction and advice. As Pinocchio learns how to prove himself through the pages of Collodi’s book, Pope Francis recommends Manzoni’s book to engaged couples for guidance before marriage. Artusi, though not a trained professional cook realized a need for a book of instruction and began classifying Italy’s great culinary and cultural tradition of regional, domestic cuisine and what it takes to become a good cook. And what we learn from his writings is that cooking is both an art and a science. Artusi believed there is a science or technique to the “art of making something as economical, savory and healthy as possible”. That technique is as important as the ingredients used in preparing a dish and affect the dish as much as the ingredients themselves. Artusi knew that to please the taste of Italians you need to combine la scienza e l’arte . Time, temperature and proper combinations are the science and the cooks’s intuition the art. He advises his readers with an air of scientific authority to make a dough more tender and digestible, add a little lard when mixing the flour with cool water and salt and “the schiacciata will puff up better if you drop it in a skillet when the fat is sizzling but which you have removed it from the fire”. These tips on technique should not fall on the deaf ears of a cook. According to our Italian cousin Andrea who recently graduated from a culinary course of study in Milan, one should always chill your blade attachment and blender bowl in the freezer when making pesto to avoid damaging the tender basil leaves from the heat generated by the motor of the food processor. The science behind the art of making a great pesto! It was another magical evening in Italy. Sitting under the vine covered pergola we watched the flames from the wood fired brick oven lick the surface of our bistecca fiorentina until it had become charred and brown. The scent of lavender and rosemary lingered in the air and as the sun set, the leaves of the olive trees glistened like silver. Framed in the door way of our casa colonica was a well-worn farmstead table with a plate of crostini and the obligatory bottle of vino rosso. And then it happened, out in the distance as if competing with the lights from the Tuscan hill towns in the valley below, flickering dots of white appeared in the sky. Like hundreds of miniature Italian “fairy” lights on a Christmas tree they began to pattern the sky. We were right in the middle of a light show courtesy of Luciola italica, the Italian glowfly. Lucciola italica comes from the family Lampyridae, of which there around 2,000 different varieties in the temperate and tropical regions of the world. Glowflies (often called lightening bugs or fire flies in the States) can be found in gardens and naturalized areas from June through early summer. The ability to generate their LED-like glow is reminiscent of an alchemic reaction that occurs in the insect’s abdomen. Luciferin, a biological pigment activated by the enzyme luciferase, is fueled by oxygen and voilà, bioluminescence. Both the male and female are capable of producing this effortless glow primarily to lure prey, discourage predators and most importantly to attract a mate on those dreamy midsummer nights. The glowfly can only survive in extremely balanced ecosystems, where it can find its preferred food, the garden snail. Together they are part of a balanced ecosystem and your gardening ally. The presence of glowflies illuminating your Italian garden is an indication that your garden is healthy and well-adjusted and living “la dolce vita”. Good Friday (venerdi santo) is a solemn, sacred day in Italy and when it comes to food the menu for a ‘pranzo di quaresima‘, a luncheon meal for this final Lenten observance has a long and important tradition that goes back to the recognized bible of Italian cooking, Science in the Kitchen and the Art of Eating Well by Pellegrino Artusi. Generations of Italians have grown up with the book of Artusi as a main guide to cooking. Written in 1891 with over 700 printings it is one of Italy’s most read books, together with Pinocchio, and a copy was present in almost every Italian home. Today there is a center in Artusi’s hometown of Forlimpopoli dedicated to his work. Artusi wasn’t a chef but a merchant from Romagna who after a successful career decided to retire and dedicate his time to his hobbies – writing and cooking. He collected and compiled recipes and insights on the culinary and cultural traditions of regional Italian food from various sources, friends and relatives codifying and classifying the tradition of Italy’s domestic cuisine gathering together hundreds of regional Italian recipes and experimenting with them. He recognized the long and important tradition of foods eaten on holidays and seasonal celebrations especially those at Easter time and those eaten just before Easter. On the last few days of Lent when only “lean” foods were to be eaten, ones that Italians call “magro”. The menu for “il pranzo di quaresima” doesn’t seem to be so lean or penitential as the ingredients are quite rich and lavish in this day and age. The meal begins Minestra –Zuppa alla Certosina, (Carthusian Soup) a fish and tomato soup that originated in a Tuscan monastery, the beautiful Certosa del Galluzzo which sits on top of a hill just outside Florence on way to Sienna. This is followed by a course Artusi refers to as the Principii, – Baccalà montebianco con crostini di caviale , pounded codfish with cream, a garnish of raw truffles and croutons or crostini of caviar. Followed by Lesso – boiled/poached Pesce con salsa genovese, fish with a Ligurian pesto sauce. Then an interposed Tramesso of Gnocchi alla romana, discs made from semolina flour topped with butter and melted cheese. Next an Umido (stew) of Pesce a taglio followed by Arrosto grilled Anguilla (Comacchio eel). For dessert, Dolci of Pasticcini di marzapane e gelato di pistacchi, marzipan filled pastry tarts and pistachio ice cream. A Lenten feast that gives real and lasting joy in sharing ourselves at the table. I wrote this post several years ago but the memory is as vivid now as then. A must see under the Duomo if you are in Milano. Even though we have 40 days to prepare, celebrating Easter seems to be more about bunnies and brunch then it does about a life changing transformation. For if we follow the teachings of faith we known that “if we die with Christ, we believe that we will also live with him” (Romans 6:8). This was never felt more deeply than by the Early Christians. On all accounts their devotion and unwavering belief caused them to commit and transform their lives in a ways that seem impossible. Accepting a contra-lifestyle based on the teachings of an outlawed and unpopular doctrine of redemption often took them to the brink and it began with the sacramental waters of an Easter baptism. Images of these early Christian baptisms took on a vivid reality when I first visited the Milan Duomo, a massive Gothic spired cathedral rising out of the concrete earth of Milan Centro like it had materialized from thin air. Described as one of the greatest churches in the world (second only to St. Peter’s Basilica in Rome), the building of the Duomo took more than 500 years to complete. There are 5 naves divided by 40 pillars with 3,400 statues (1800 alone on the terraced roof). It is a fairyland of pinnacles, spires and flying buttresses with a 4 meter gilded statue of the Madonna perched on the top of the highest spire. The art and architecture of the Milan Duomo is amazing but what is more remarkable is what is hidden and unexpected. The 135 spires of the Duomo overshadow a little known paleo-Christian archeological site hidden below the surface of the city with baptismal pools (circa 378) used by the early Christians of Milan. Through a staircase on the left of the main door of the cathedral you descend into the excavated remains of a brick wall around the perimeter of a Baptistery and a Roman road. Walking along a raised platform you see a large octagonal frontal pool where the catechumens were baptized. The pool is impressive because of its size (6.10 meters in diameter) with concealed pipes that provided a channel of “holy water” sprouting from several jets. A description of the space talks about the pool being clad in Greek marble and the original flooring and walls being made of black and white marble in geometric designs. It must have been an awe-inspiring event to be led to this place on the eve of Easter and to be immersed in the water to receive that sacrament that cleanses you of your sins and binds you to all of Christendom. As many times as I’ve seen the Milan Duomo (at last count this would be 18), the one particular thing that stands out most in my mind is being in that underground space where lives were transformed forever.